Sewing things because the older I get, the worse shop-bought looks. Around a decade ago, I bought a swimming costume which I really, really loved. It was a Seafolly swimming costume, and I had never spent so much money on a pair of swimmers before. At the time, money was pretty tight in our household, and it was not the kind of purchase we would normally consider, but I really loved the style, so we decided I could have them. Fast forward ten years. Last week, I made my first actual swimming costume. ( I have sewed swimming costume patterns before, but always for stage use, not for actual swimming purposes). I'd never made swimmers before because I had never found a pattern I liked as much as my Seafolly swimsuit. But thanks to a couple of patterns from Stitch Upon A Time, I found what I've been searching for for years. Interestingly, neither pattern that I used for the top or the bottoms were specific swimming costume sewing patterns. But I have pretty much recreated the style of my Seafolly swimmers- in fact, even better- and I truly love this homemade swimming costume! The top is a hack of SUAT's Titania Top and Tunic. It is double-lined so I have the options of removeable cups if I want them. The bottoms are SUAT's underwear pattern, Bunzies, maternity waistband option (just because it is pretty, not because I am pregnant) and the booty cut option. I did not size up for either pattern.. Basically, I was too lazy to trace another pattern, so I stuck with my usual size for the Titania and the Bunzies and it worked out fine. I can't even say how much I love these swimmers; they are a style I love, they are super comfortable, and they don't have any clasps or ties like the Seafolly one which can come undone in the surf, which makes them even better than my Seafolly ones. Hurray! I loved Hey Penny's themes. I made a rashguard a few months ago with her dragon fabric, too. The cropped rashguard is George and Ginger's Daybreak Rashguard It also comes in a more sun-sensible length. 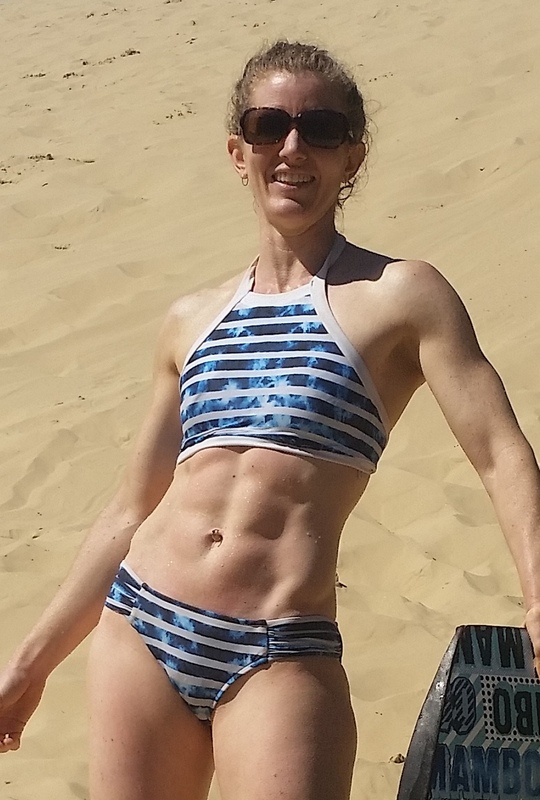 I love it, and with this rashguard and my new SUAT swimmers, I don't think I will ever purchase beachwear again. Yay!!!! Welcome to the Lush VS Black Milk Challenge! Black Milk is a very popular Australian clothing manufacturer which designs clothing for people 'not afraid to stand out'. I love a lot of what they create, but what I love even more is being able to create similar pieces for a fraction of the price! 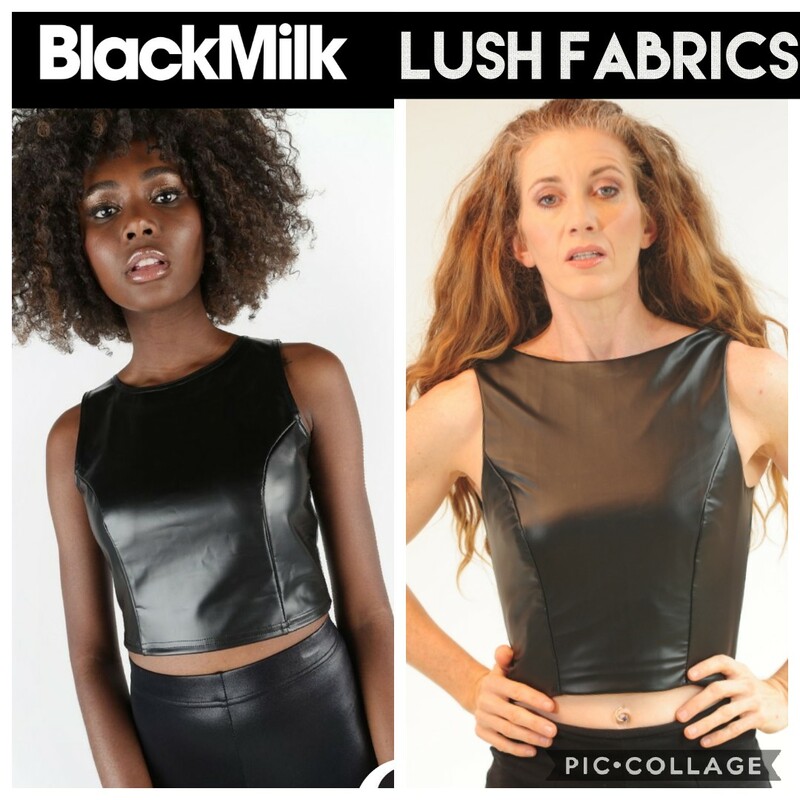 This week, with the help of Lush Fabrics, Christina of Little Pickers fame and I took some Lush faux leather and put it to the Lush VS Black Milk Challenge. Lush Fabrics stocks heaps of stretchy knit fabrics, but this faux leather has only slight stretch, so I treated it as a woven. Black Milk sells this lovely fitted boatneck crop top, which I thought would be perfect to try. It is not hard to find a sewing pattern for this look. In fact, I have three sewing patterns I could have modified to make this top. I ended up using New Look 6723. The thing I love about this style top is that it is very versatile. Personally, I would never pair it with faux leather leggings like they've chosen with the Black Milk model, though you have to admit, it definitely stands out! I'm past the age where I'm comfortable with that, though, plus I still generally like the rule that if the top is fitted, have a bit more room in the bottoms. And vice versa. (Of course, rules are there to be broken, too, so don't hold me to this!). 1. for a fabulous and classy winter outfit, add a knit short sleeve top and a pencil skirt. I didn't even need to take off my leggings! 2. For a breezy summer look with an edge, pair it with high waisted shorts and some strappy heeled sandals. 3. I would LOVE to steal Christina's Lush VS Black Milk faux leather skater skirt creation to pair with this top for a cute and spicy skater dress. 4. How about pairing it with a pair of tartan cigarette pants? Or a funky pair of palazzos? So many options!! The Black Milk version of this top retails for $60 (which is pretty reasonable!). I was able to make this for approximately $20, and the added bonus is that it is actually fitted to my exact shape. I think you will agree, Lush has come off very favourably in this challenge. Make sure you check out Christina's Lush VS Black Milk Challenge, too, in our double blog! * My leggings are Jalie Clara leggings. Oh, and I just realised! 20 years ago I made a very similar outfit for a band I was in, a black PVC crop top with black PVC pants! OK, I'm hardly geriatric, but I think we can agree that I am not typical leotard-wearing age. Good. Typical is boring. Jalie has just released another phenomenal collection of sewing patterns, and I thought it would be interesting to show an adult in the new Joelle pattern. Those who follow me know that I enjoy taking Jalie's skating and gymnastics patterns and bringing them into daywear; Jalie's skatewear patterns often have a lot of lovely design features which work well in casualwear, too. Joelle caught my eye because of the lovely open back combined with the mock collar. I had some leftover spandex from sewing gymnastics longs for my son a couple of years ago, so I used that to give Joelle a whirl. 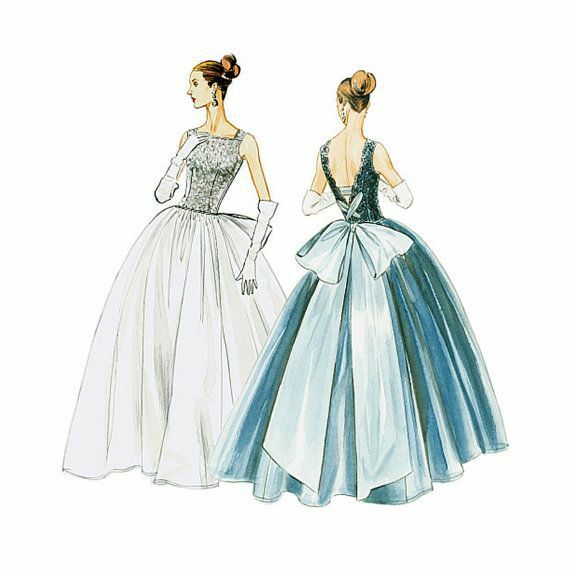 As expected, the drafting of the pattern is excellent. I sewed my usual size R and didn't need to make any modifications. I haven't sewn an invisible zipper for a long time and I don't have a special invisible zipper foot, so I followed Burda's excellent tutorial. I don't actually plan to wear this as a leotard- I'm not currently involved in any leotard-requiring activities- but I DO have some plans for styling the lovely Joelle. 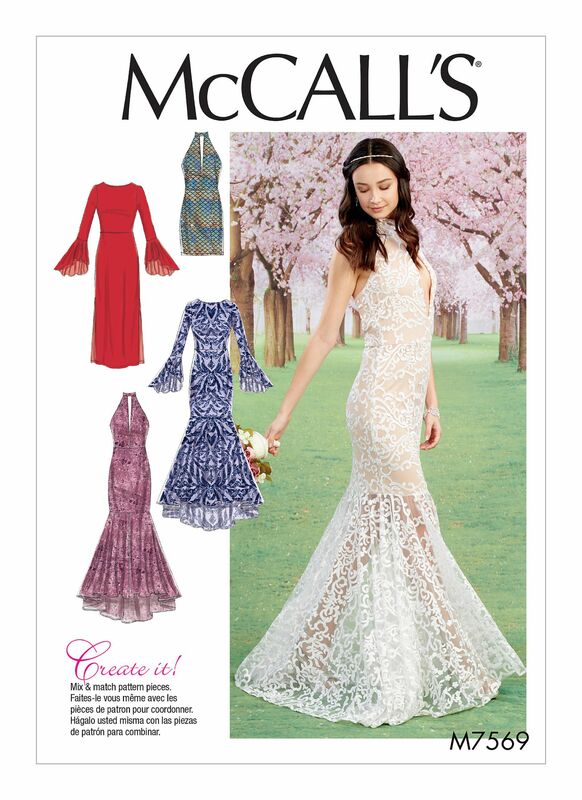 Joelle would go very nicely with Jalie's new pencil skirt pattern, Lisette. What about some tulle for a bit of fun? And how about pairing it with a long formal mermaid skirt? Or a full floor length circle skirt? How would you style the lovely Joelle? The second pattern that I tested from Jalie's new collection was the Melanie kimono (the first was the Clara leggings). Melanie is a beautifully drafted, knee-length kimono designed for woven fabrics, with 3/4 length sleeves, pockets, and a sash. I was very keen to sew Jalie's kimono because the kimono is such a versatile clothing item, and as always with Jalie, I knew I would be happy with the design. I made life more difficult for myself and chose to work with a specialty velvet and mesh fabric which meant I sewed with the aid of a lot of tissue paper. For my next Melanie, I have a lovely, SENSIBLE rayon fabric. A kimono wrap is just a bit different as an evening jacket and looks oh-so-chic! I paired the Melanie with my faux leather Clara leggings. It's amazing how a simple kimono can dress up an otherwise plain outfit of singlet and shorts, and some added fringing really gives it a bohemian flavour. With my complexion, some kind of coverall is essential for sun protection. Happily, a kimono makes both a functional and fashionable coverall. It's simple- Sash undone means you're open for business, sash closed means business hours are over. So there you have it. The kimono can more than justify its place in your wardrobe. In face, like me, you may have plans for more than one. Introducing the Jalie Clara leggings! I was thrilled to be asked by Jalie to be one of their promotional pattern testers. I tested three patterns, and this first pattern, the Clara leggings, has generated a BUTTLOAD of interest. Ha ha. See what I did there? I have at least 10 different sewing patterns for leggings, and it seems that I am not alone in pursuing the Holy Grail of leggings: ones which look great, stay up, cover everything we want covered, and avoid the dreaded cameltoe. Introducing Jalie's Clara leggings, which may just be the Holy Grail of leggings. With no front seam and a gusset, I think you will agree that I have attained Barbie Doll crotch status with these tights. I associate gussets with athletic tights, so for my first pair, I made the Claras out of supplex. I thought the wide contoured waistband looked great for staying in place doing squats, and I was right. They are super comfortable as athletic tights. I have never felt so much like Catwoman before in my life. And I like it a lot! So there you have it. The incredible, possibly groundbreaking Clara leggings by Jalie. I have one more test for them- I'm looking forward to trying them in plaid to see how the pattern matches. Now, I'm not saying Claras will replace every other leggings pattern. There are great athletic leggings patterns out there (I love Jalie's Cora and Isabelle and Greenstyle's Stride Athletic tights for all the colour blocking options). But for all other casual leggings and comfortable circus/yoga style leggings, Clara will be my new go-to pattern. A(nother) Brand New Blog for me!! I had a sewing blog years ago and let it lapse because I couldn't figure out how to make the blog do what I wanted it to do. But I'm involved in some exciting sewing projects and I really want to share, so take 2. We'll see how we go!